What is one way to make a really big impact on a single community? You help sponsor the ninth annual Big Give competition, just like TDS did. Yes, a competition—but a really unique one. People from Holloman Air Force Base and the surrounding New Mexico communities come together to try and out-volunteer each other. The mission of Big Give is to change lives. To do that, residents form teams (at least some of the members must be associated with Holloman) and try to do the most impactful, big, volunteer project in the Alamogordo, New Mexico area. Just how big? Really big. For example, this year participants painted a school, stained playground equipment, made repairs and painted a local shelter, and hosted a food drive. Given the size of the tasks, teams had more than a single day to complete their projects. The event kicked off on July 18 and the 412 participants (on 32 teams) had three weeks to finish. On August 12, participants and community members gathered for the Big Give After Party to celebrate all of the accomplishments. Each team presented the results of their efforts to a judging panel who handed out 1st, 2nd, and 3rd place prizes, along with two People’s Choice awards. 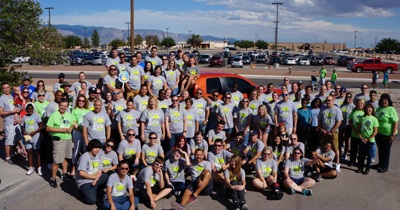 In total, Big Give participants volunteered 4,997 hours in the community and saved Alamogordo a total of $202,092.33. This brings the grand total, for all nine years of the event, to a savings of $1,881,513.67!